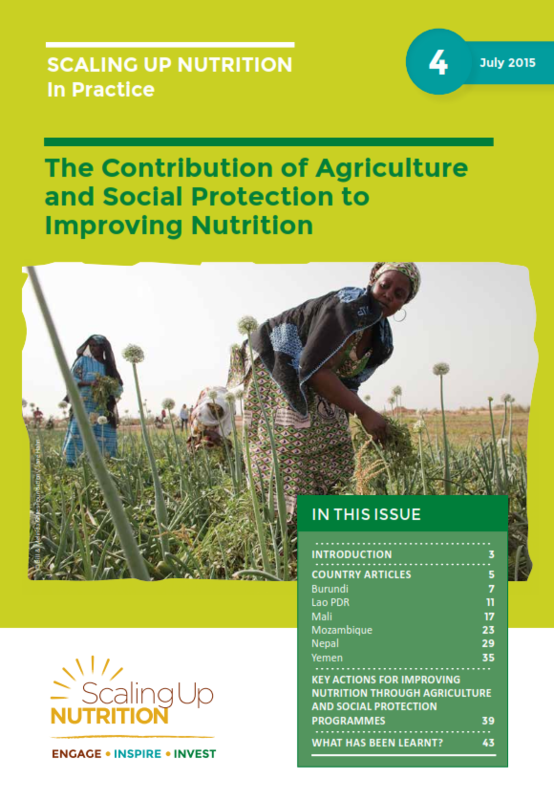 Launch September 2015: The fourth Scaling Up Nutrition: In Practice brief focuses on how agriculture, food systems and social protection schemes are contributing to scaling up nutrition in SUN Countries. Representatives from six SUN Countries share their accounts of how food, agriculture and social protection stakeholders engage in nutrition coordination activities to achieve nutrition outcomes. Key challenges are identified in each of the country articles. Burundi is integrating nutrition in sectoral policies and development plans which are backed by high level political commitment to scale up nutrition. The two main priorities of their multi-sectorial strategic plan for food security and nutrition is to improve hygiene practices through a hand washing initiative as well as to promote dietary diversification through backyard vegetable gardens in schools and households nationwide. Lao PDR, has made significant efforts towards establishing a multi-sectoral committee on nutrition which aims to ensure increase investments in nutrition and to establish the institutional arrangements needed to improve food and nutrition security. In addition to the committee, the Ministry of Agriculture and Forestry and the Ministry of Health have begun to dencentralise the nutrition coordination process. Mali, has operationalised their 2013 National Nutrition Policy with a multi-sectoral nutrition action plan. The Ministry of Rural Development takes responsibility for improved seed dissemination and, together with the Ministry of Humanitarian Action, they work on emergency responses. The Social Development Ministry is responsible for the transfer of social benefits that can improve the nutrition status of households. Nepal has developed strategies and plans to address the problem of food insecurity and promote nutrition, attempting to increase the availability of quality food and to increase the income and reduce the workload of women. Social protection schemes are helping to provide sufficient food and nutritious diets for poor and socially excluded groups. Yemen’s development partners and the government have been engaged in developing a long term integrated multi-sectoral action plan for combating under-nutrition with the engagement of all sectors. The agriculture, food security and social protection sectors have agreed on the principle of programmatic and geographic convergence in that all sectors will work together in around half of the districts with a high burden of under-nutrition. Mozambique undertook a baseline Food Security and Nutrition (FSN) Survey in 2013. Results showed that more than 7000 households in the country indicated that nutrition is not directly linked to food availability but is linked with food utilisation, access and education. National programmes are highlighting the fact that the use of social protection measures are essential to addressing stunting as a cross cutting issue. The Scaling Up Nutrition: In Practice briefs present the experiences of SUN Countries, and other national stakeholders, as they scale up their efforts to ensure all people enjoy good nutrition. Each brief in the series focuses on a theme selected by SUN country government focal points for sharing their experience during a series of teleconference calls with focal points and country teams that take place every two months.